I was musing a posting or two ago on when to feed my bees. The time is now (for me). The alders are in pollen, but the weather is too foul for the bees to come out (rain, snow, freezing sunny days). The Big Leaf Maples should be in bloom in 6-8 weeks in this area. They are the first big nectar flow in our area. I don’t usually like to feed so early, but December was mild and the girls kept eating, so the hives, which had been left with the traditional 50-70 pounds of honey, were getting light. All things considered it seemed a good time to head off to the hives on a nice sunny day. To feed my bees the hives need to be swapped from winter mode to spring/summer mode. All my hives are wrapped and have insulation in them each winter. Off come the ropes, then the asphalt roofing “hat”, then the insulation is removed. This makes space for the feeder and the pollen-substitute patties. 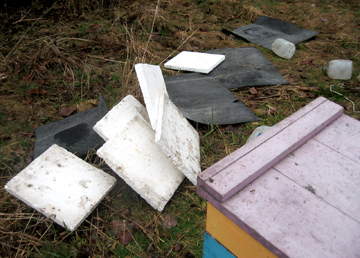 If the weather is good, I pull the boxes apart and check the hives. 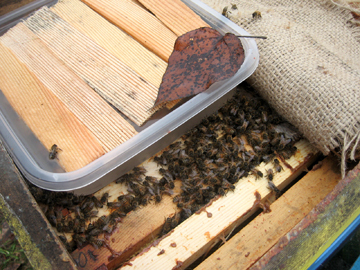 The weather has not been good, so my checks are: can I see bees and honey without moving any of the top bars? If no bees, can I see honey and when I knock on the side of the hive do I hear the bees? I worry in either case, of course. If they’re on the top: did they not have enough food? If they’re in the center box: are they too small a cluster to move? In either case, they get fed. During this I takes notes. I’ve been teased about this by other beekeepers. If you are too, ignore the teasing. It does take longer to make notes, but they can really help you trace both problems you need to address and successes you want to replicate. It is worth the time. 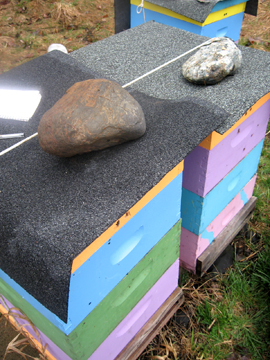 I had hundreds of hive in each field, I would make generalized notes on the bee yard. As I never have more than 12 hives in any one bee yard, each hive gets a note. I feed cane syrup with essential oils: lemon grass, spearmint, and thyme and pollen substitute made with the same mix. The syrup is poured into in what I call the “dollar store” feeders: plastic food storage containers (bought at the dollar store), in which I float off-cuts of Douglas fir, from my husband’s furniture creations. The floats never quite fit, so I put leaves or bunched grass around the edges to give the bees something to walk on (dead, floating bees depress me). 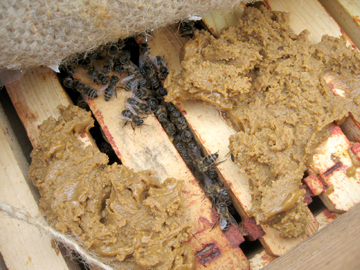 The trays rest inside a collar that sits on top of the hive – rather like a hive top feeder. The pollen substitute patty sits on the top bars next to the feeder. 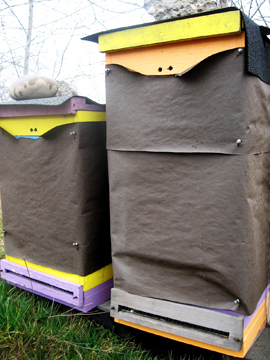 A piece of burlap, that covers the top bars in the winter, is now folded over to form a “ramp” for the bees to walk up. Beyond babying my girls, this burlap forms a first-line-shield for any water that may form under the cover. There is ample ventilation in the hive, but I’m adding ¾ of a gallon of liquid to the hive, plus this is the Pacific Northwest, so water gets everywhere and there is little exterior warmth to help dry any building – house or hive. Because of this, I do leave the asphalt roofing “hats” in place until the rains stop. The ropes and rocks help hold the asphalt in place in the high winds that can blow here. 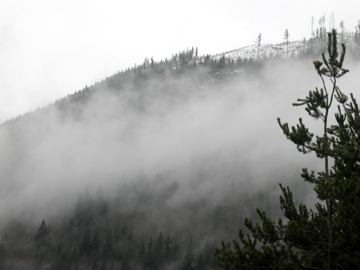 In fact the winds brought more bad weather in the middle of my winter-spring change-over. A storm blew in and dumped 3-4 inches of snow over 2 days. Which was nicer than yesterday’s 8 inches…. Really, it’s beautiful here, but not the best place to raise bees. The hives did look good this year. I only lost 3 hives. In each case it looked like the queen superceded sometime between November and March – which is a death sentence for the hive. I’ll accept that loss. 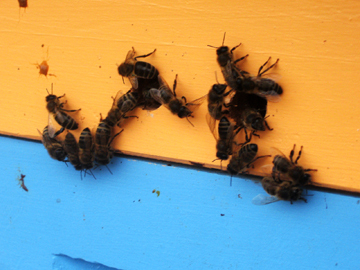 The rest of the hives look good, and some of the girls even decided to come out and check out their now colorful homes. What’s spring like in your area? What changes do you make in your hives over the season? Do share, we can all learn from each other. 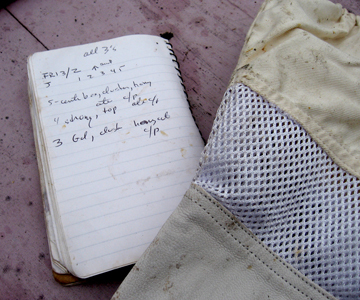 This entry was posted in Beekeeping and tagged Bean, beekeeper, bees, Brookfield, Farm, feeding, honeybee, how to, Karen, Maple Falls, preparation, spring, Washington, Winter. Bookmark the permalink.